Main sources: Nowak, Ronald, 1991, Walker's Mammals of the World, Fifth Edition (two vols. ), Baltimore: Johns Hopkins University Press; Hoffmeister, D. F., 1986, Mammals of Arizona, Tucson: University of Arizona Press; Burt, W. & R. Grossenheider, eds., 1976, A Field Guide to the Mammals, Peterson Field Guides: Houghton Mifflin. For a general overview of the distinctive characteristics of skunks compared with other animals, look under "Mephitidae" in Mammals. Spotted Skunks are on the small side (1- 2 1/2 lbs), and they differ from "Striped" and "Hooded" Skunks (Mephitis spp), and from "Hog-nosed Skunks" (Conepatus spp), in having white stripes that are both numerous and interrupted, so the stripes appear as white "spots" on the body (No other mammal has this color pattern.) They also have a broad white nose patch (behind the snout) rather than (as Mephitis species) a narrow stripe there (see Hoffmeister pp. 503-13). 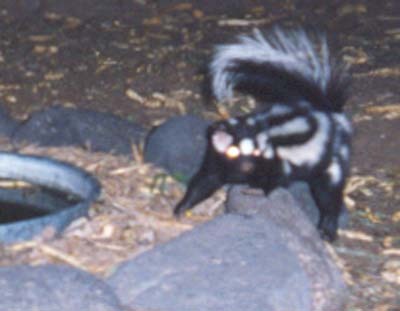 Setting aside the distinctions between Western and Eastern varieties of Spotted Skunk (Gracilis versus Putorius), which are arcane, the Western subspecies shows two varieties: S. gracilis gracilis, which occurs mostly north of the Mogollon Rim, and S. gracilis leucoparia, which occurs mostly south of there. Leucoparia has a much broader lateral white stripe than does its northern neighbor, and as we can see in the accompanying photographs, our S-J animals display quite broad lateral stripes. See also the comparative drawings in Hoffmeister p. 507. Spotted skunks are the most reclusive of the Family and are seldom seen. They are also the only ones that hunt/forage in trees. Spotted Skunks are nocturnal and active year-round, but are generally quite inconspicuous. They usually den underground, but are good climbers and sometimes shelter in trees. Home range is up to 160 acres. They are omnivorous, feeding especially on insects, small rodents, rabbits, birds and bird eggs, and various seeds and fruits. They often occupy rocky areas, and their bold behavior toward humans is notorious (and consistent with their very bright color contrasts), for example pulling on people's hair when in their sleeping bags (Hoffmeister p. 507). When threatened, they may advance toward the adversary, place forefeet to the ground, assume a horseshoe position with their hind legs above them and pointed forward, and spray their musk toward the opponent. Their scent is somewhat sweeter in smell than that of striped skunks, which are more pungent. Several Spotted Skunks may nest together in winter. Litter size typically ranges from 3 to 6, and the young "have adult coloration after 21 days, open their eyes at 32 days, can spray musk at 46 days, are weaned at about 54 days, and attain adult size at about 15 weeks" (Walker II: 1132) Captive specimens have lived for up to 10 years.